Although articles reporting research studies are helpful in acquainting students with methodological approaches, they often make the process look so straightforward, clean, and effortless. It is rare to find an article that tells the "real" story behind the finished product. By having real researchers tell their own stories of "mucking around" with methodological and ethical issues in qualitative research, we get a more realistic, human story of the process. This is a collection of such stories. Authors were asked to describe their own experiences with methodological and ethical struggles as they engaged in their work. Each of the essays offers insight into the research approach used as well as particular issues which became apparent during the research process. Key issues raised by the authors include early learnings; gaining entry; overlapping, conflicting roles, and the boundaries of these roles; differential power relationships; who tells the story and whose story is told; ethical concerns related to confidentiality; and the influence of a researcher's particular philosophy or theoretical framework on his or her research. Throughout the book we see scholars whose personal stories or autobiographies intersect closely with their research projects. deMarrais introduces a unique framework to help students gain an overview of qualitative research methods and the underpinnings and processes in these approaches. This framework is centered on the ways we understand phenomena using qualitative research approaches that engage archival knowledge, narrative knowledge, or observational knowledge. "An outstanding feature of this book is that it addresses what is often the key difficulty for many novices--identifying the research question….I have not come across a book more effective in communicating a sense of the tentative, often blundering, and ultimately human nature of question shaping in qualitative research." "The strengths of Inside Stories are its explicit exploration of many complex problems and issues that qualitative researchers face on a daily basis, its accessibility to novice researchers, and the interesting diversity of studies discussed. This book is like the qualitative research approach it describes: polyphonic, personal, political, and layered with complexity." "Represents a wide array of approaches to conceptualizing and engaging in qualitative research and reflects the ongoing debates in the field over such issues as representational accuracy and ethics, power relations, and the relationship between research and social action. As such, the book reflects cutting edge thinking about qualitative research….I am very impressed….This is a wonderful pedagogical resource….unique and very much needed." 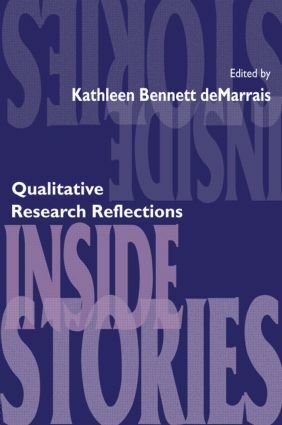 "A significant contribution to the study of qualitative research….The narration here involves the 'stories people tell' about their experiences with qualitative research….Because the essays are very readable and brief but offer a variety of issues, pedagogically they will provide the jumping off point for deeper discussions of the issues, methodologies, and practical concerns the texts raise." Contents: K.B. deMarrais, Introduction. J. Spring, Gold Mining History in Search of Personal Understanding. J. Habel, Precipitating Myself Into Just Manageable Difficulties: Reflections on Constructing an Intellectual Biography of Nicholas Hobbs. S.M. Oran, Traveling Light: A Student's Guide to Packing for Qualitative Research. D. Deyhle, The Role of the Applied Anthropologist: Between Schools and the Navajo Nation. C. Sleeter, Activist or Ethnographer? Researchers, Teachers, and Voice in Ethnographies That Critique. L.C. Velázquez, Personal Reflections on the Process: The Role of the Researcher and Transformative Research. J. Gamradt, "Studying Up" in Educational Anthropology. R.Q. Smith, Revisiting Juanita's Beauty Salon: An Ethnographic Study of an African-American Beauty Shop. K.B. deMarrais, Mucking Around in the Mud: Doing Ethnography With Yup'ik Eskimo Girls. L. Smith, Tracing Literacy Across Three Generations…Trying Not to Lose the Voices. K. Altork, You Never Know When You Might Want to Be a Redhead in Belize. K.D. Tunnell, Interviewing the Incarcerated: Personal Notes on Ethical and Methodological Issues. M. Eyring, How Close Is Close Enough? : Reflections on the Experience of Doing Phenomenology. M.J. Ronan Herzog, Teacher-Researcher: A Long and Winding Road From the Public School to the University. B.B. Swadener, M.M. Marsh, Reflections on Collaborative, and Not-So-Collaborative, Research in Early Childhood Settings. E. McIntyre, Who Is Taking Risks? Moving Toward Collaborative Research. D. Walsh, Incomplete Stories. M.D. LeCompte, Synonyms and Sequences: The Development of an Intellectual Autobiography.